GW2580 is a selective CSF-1R inhibitor for c-FMS with IC50 of 30 nM, 150- to 500-fold selective compared to b-Raf, CDK4, c-KIT, c-SRC, EGFR, ERBB2/4, ERK2, FLT-3, GSK3, ITK, JAK2 etc. CSF1R c.1085A>G genetic variant confers the sensitivity of macrophage survival to CSF-1R inhibitors. Macrophages differentiated from peripheral blood mononuclear cells were incubated with various concentrations of the CSF-1R inhibitor, GW2580 (C) for 8 days. Percentage of cell survival was determined by CellTiter-Glo® Luminescent Cell Viability Assay. BLZ945 is an orally active, potent and selective CSF-1R inhibitor with IC50 of 1 nM, >1000-fold selective against its closest receptor tyrosine kinase homologs. 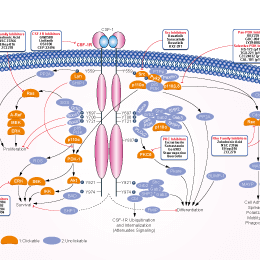 CSF1R c.1085A>G genetic variant confers the sensitivity of macrophage survival to CSF-1R inhibitors. Macrophages differentiated from peripheral blood mononuclear cells were incubated with various concentrations of the CSF-1R inhibitor, BLZ945 (B) for 8 days Percentage of cell survival was determined by CellTiter-Glo® Luminescent Cell Viability Assay.